Last week I shared the story of Silas, who is always looking backwards while walking forwards and often falls because of it. When I said to him, "You need to turn around and watch where you're going or you're going to fall again!" I immediately realized there was a devotion there, which actually became two devotions. Last week we looked at the danger of looking backwards and this week, for part 2, we're going to look at the necessity of looking forwards. Our sidewalks and roads are chock full of pot holes and missing sections of pavement. There are a couple of sidewalks I don't use at all because they're in such a sorry state that I can't push a stroller along them. Picture yourself trying to walk along those uneven sidewalks while simultaneously looking backwards and you'll understand why Silas so often falls. His feet get caught up in the holes, dips and chunks of uneven pavement. As I so often have to remind him, he needs to be looking where he's going so he can see those obstacles and prevent the falls. When I started thinking about my frequent reminders to Silas as a possible devotion, the second verse that came to mind was 1 Corinthians 10:12, where Paul warns believers, "If you think you are standing strong, be careful not to fall." This verse follows a section in which Paul recounted the sins of the Israelites and the punishments they had to endure for their sinfulness. We have a tendency to look at other people's sins and think, "How could they do that? I'd never be so stupid." And maybe that's true, in regards to the particular sin they committed. Maybe we aren't tempted to have an affair or to steal from the company, which is all well and good, but that doesn't mean we are immune to sin. Though the same sin may not tempt us, we can be guaranteed that there are other sins we do find tempting. "If you think you are standing strong, be careful not to fall" may sound silly, but Paul is really telling us to turn around and watch where we're going. 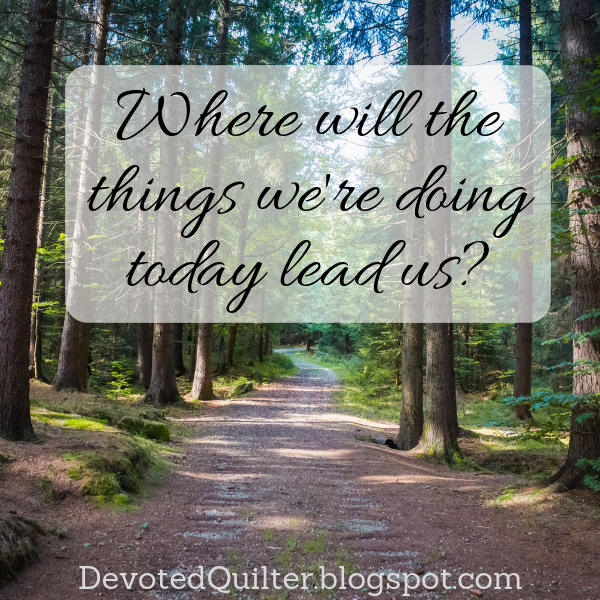 Where are the things we're doing today leading us? Looking ahead along the path we're traveling may reveal potholes and uneven pavement that could trip us up. We might think we're okay today, standing strong as Paul said, because we aren't doing anything wrong. But are there habits or relationships beginning to form that could lead us into sin in the future if we're not careful? Are we starting to spend time with people who are negative, complaining all the time and who rarely have a nice word to say about anyone? Look ahead. Where will those friendships lead? Will we become negative complainers who judge everyone around us? Are we spending less and less time with the people who are most important to us, choosing instead to spend time on social media or on our hobbies? Where will that lead? Will those important relationships suffer because of how we're spending our time today? We need to be aware of where we're going so we can see those obstacles ahead and adjust our direction to avoid them. If we're spending all of our time looking back, we'll never see the potential dangers of where we're going. If we spend all our time looking at the sins of others, we'll never have the chance to make corrections to our own path and we'll find ourselves shocked when we are the ones who fall. Carefully watching where we're going will help to keep us standing strong in the future, too.